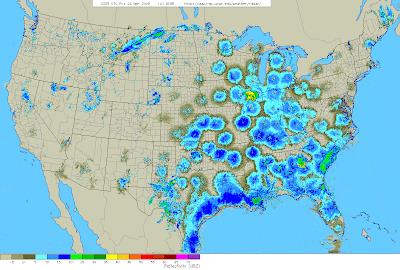 As you can see the SE corner of the country is lighting up with birds tonight. The northeast is currently quiet due to a stiff WNW breeze, but this will be shifting to the SW during the day tomorrow. Friday and Saturday nights (at least) should bring perfect migration conditions. We're in prime overshoot time, and we should be on high alert for something like Swainson's Warbler (as of yet unrecorded in CT) or Wilson's Plover. But it will just be nice to see and hear more than the 3 common early-season warblers. Move inland a bit and find some streams in the woods and you can have a fourth common warbler too!